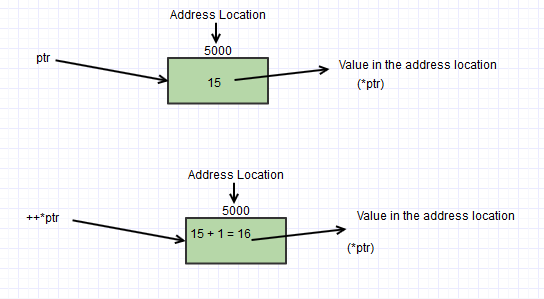 We have to first think that the meaning of the *ptr, it is pointing to the value that is being located at the address location. Then we have to consider the below points. ++*ptr: means the value that is pointing to particular location is incremented by one. *ptr++:means that the value that is pointing to the particular address location is incremented by one. Which behaves like the post-increment operator. Here we assume that the address of the integer value is 5000. 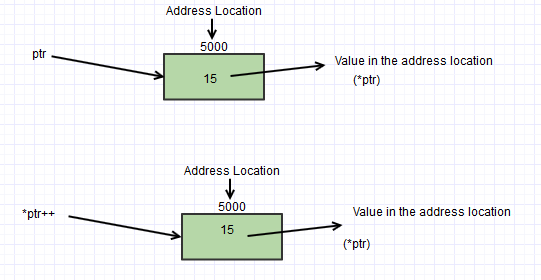 Here in the above diagram it is referring to the same address location and the value being incremented. See the output is exactly matched with the value that we are showing in the above diagram. Here in the same way as we assume the address of the ptr is 5000. Let us see the pictorial representation of the above scenario. That is same as the value that is shown in the figure above. So by seeing the above examples we can easily find the differences between the ++*ptr and *ptr++ .